Sometimes when I plug in my headphones it seems as if I'm not receiving any vocals. Its still stereo, but I find that the headphone jack isn't completely in. What's going on here? And why does it work so effectively at removing vocals? The quick answer: You're hearing the two stereo channels mixed, with one of them out of phase with the other. I can't for the life of me figure out how this happened, though. In the interminable rambling below I talk about a couple of other crossed connections that can, and often do, happen, but unless there's a bit of wire stuck in the headphone socket or some other such oddity, I don't know how you could have the exact symptoms you report. Unless, of course, what you think you're hearing isn't what's actually happening, which is eminently possible since the ear is as easy to fool as the eye. Anyway, mixing one stereo channel with an opposite-phase version of the other channel means that any component of the musical mix which is essentially monophonic - in the middle of the stereo "soundstage", the same on both channels - will be cancelled out. Singing in popular music is, usually, pretty much in mono in the middle of the stereo mix. So mixing one side with a phase-flipped version of the other side will cancel out said singing; all you'll hear of the singer is any stereo reverb or difference in volume between the two sides (a.k.a. panning). This technique, called Out Of Phase Stereo or OOPS, is used in this simplest form by old and/or cheap karaoke machines that let you "mute" the vocals on normal music, so you don't need a special vocal-less karaoke version of every song. Simple OOPS doesn't work very well, because vocals are seldom exactly in mono (they usually have some stereo reverb, for instance), and if any other component of the mix - drums, bass, whatever - is also mono, then that'll be muted too. Smarter OOPS vocal-muting tries to identify and mute only the vocals, based on the pitch and possibly even the timbre of the sound. This weirdness can come about because headphone plugs use TRS (Tip, Ring, Sleeve) connectors. TRS connectors come in a variety of sizes - the big old-fashioned 6.35mm (quarter-inch), the ubiquitous modern 3.5mm (eighth-inch), and the usually unnecessary and irritating 2.5mm (3/32 or 1/10 inch, depending on who you ask). 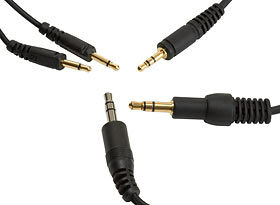 All three-contact audio TRS connectors are, or should be, wired the same way; the tip of the plug is left channel, the ring is right channel, and the sleeve at the base of the plug is a shared ground. ...come with a 6.35mm adapter for it, too. ...but the other has a 3.5mm TRS on one end of its cable, and at the other end the cable splits into a pair of 2.5mm TS plugs, one for each side of the headphones. If a TRS plug isn't fully inserted, contacts on the plug can touch the wrong contacts in the socket. A partially-inserted TRS plug could, for instance, leave the tip contact on the plug touching the ring contact of the socket, and the plug's ring contact not touching anything, and the sleeve of the plug still touching the sleeve of the socket, because the sleeve is much longer than the other two contacts. 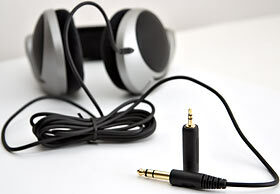 This sort of mis-connection will give you the signal meant for your right ear in your left ear, and no sound from the right side of the headphones. I encourage readers, by the way, to try this out yourselves; it's pretty much impossible to hurt your headphones or anything you plug them into by only plugging them in half-way. So do that, especially if you find my interminable blather confusing, or just want to see if you can create Simon's symptoms for yourself. Another mis-connection could have the plug-tip touching the socket-ring, and plug-ring touching socket-sleeve. Now you'll hear the signal meant for the right side through both ears, but it'll sound weird, because it's out of phase, as mentioned above. This is because the left and right "drivers" of the headphones (the electromagnetic transducers that actually make the sound) are, with this mis-connection, now wired in series, with the wire going "out" of the left driver that's meant to connect directly to the sleeve contact instead only being able to connect to the sleeve through the right driver and the plug's ring contact, thereby feeding the right driver "backwards". This causes the right side to be out of phase - when the left driver is moving toward your head, the right one should be too, but now its phase is inverted and it's moving away. There are two reasons why I'm rabbiting on about this stuff at such outrageous length. The first is that basic audio cabling like this is something that almost everybody has to deal with, and it pays to know what connects to what even if you don't intend to be soldering up any cables of your own - though basic soldering is easy to learn, cheap, and can save you quite a bit of money. The second reason for this ridiculously large post is that phase problems are actually very common in home audio, and not only among people who fix their own headphones and get one set of Profanity-Allowance-consuming minuscule wires backwards. People have been creating phase problems ever since the invention of stereo, occasionally by mis-connecting a turntable cartridge, but usually by wiring one of their stereo speakers the right way around (red terminal on the amplifier to red terminal on the speaker, and black to black) and the other the wrong way (red to black, black to red). In this case, each speaker actually is playing the signal that it should be, but one is phase-inverted. If you've got two working ears, you definitely can hear when stereo has one side out of phase. It's hard to describe, though; it's sort of like having a head cold that's blocked one of your Eustachian tubes but not the other, or how things sound when an air-pressure change has popped only one of your ears. Here's a page that explains this, with nifty audio samples including one (MP3 link) that should sound mono in the first half and out-of-phase pseudo-stereo in the second half. Out-of-phase audio sounds different on headphones and speakers, because of the basic differences between the two devices. Headphones deliver pretty much pure left-signal to your left ear and right-signal to your right, but each of your ears hears both members of a stereo speaker pair, plus umpteen reflections and resonances from the room you're in. For this reason, if you're listening to stereo speakers with one side out of phase, there will be strangely little bass, because low-frequency sound has a long enough wavelength that the out-of-phase speakers can mix their sound even if they're separated by a few metres. Higher-pitched centre-mixed components of the music won't cancel as much, though. Just to make things even more complicated, sometimes it's good to reverse the phase of a subwoofer or surround speakers, to compensate for subwoofer location or the distance of the surround speakers. There's often a hardware switch on a subwoofer or a configuration option on a surround receiver that'll let you do this, or of course you can just switch the wires around or make a crossover RCA cable. There are also some stereo recordings on which phase reversal is undetectable, because the two channels share nothing at all. Many early stereo rock tracks are like this, and are pretty much intolerable to listen to with headphones because the stereo mix puts each instrument entirely on the left or right channel. Ringo and Paul on the left, John and George on the right. Nobody minded this very much at the time, because almost everyone heard this music in the mono mix, but to make these tracks listenable with headphones you need a fancy headphone amplifier, or music-playing software, that has a "crossfeed" control, to deliberately mix some right into the left and some left into the right. Out-of-phase mono - the same signal on both sides, but one way round on the left and the other way round on the right - kind of sounds like stereo, because you genuinely are hearing something different on each side. So what I think you, Simon, are hearing from your partially-connected headphones is a mixture of left and right, with one side's waveform inverted, the resultant mono signal being heard one way round on the left side and the other way around on the right. I just can't figure out how you could electro-mechanically get this to happen by only partially plugging in the headphones. I presume there's one contact on plug or socket that's touching two contacts on socket or plug, but I don't know which. It is, again, entirely possible that you're not perceiving what's going on correctly; psychoacoustic effects can be powerful. But perhaps I'm just insufficiently imaginative. Any ideas (or experiment reports! ), commenters? Wait, have you tried this Dan? I find this very easy to reproduce - I first noticed it on my discman in 1998, but you can do it on iPhones. Just gently pull the 3.5mm adapter out until you lose part of the signal - done. A lot of music sounds like 'karaoke' versions or you can hear stuff you normally wouldn't. For poorly mixed podcasts (with some voices on the left channel and some on the right) it seems to mix the two together so it's mono and comes through both L and R.
It seems like there are two channels to each side of the stereo signal on left and right and you're pulling in one of them and downmixing it to mono. What's actually going I don't know but that's what it sounds like to me. But this effect is very easy to reproduce, and can be done with just about anything - I've reproduced it on a variety of headphones and music players (discman, walkman, iPhone). It's a very cool effect and can help you hear things you normally wouldn't here. Try it with some rock music Dan - just slowly edge out the connector and you should hear it. I suspect what may have happened is that the common ground between the two channels was not connected, resulting in both headphone drivers being wired in series and the L and R outputs in inverse series. Just for the record, I have most definitely heard exactly what Simon is describing. I can't remember which pair of headphones plugged into what device, but I goofed around with this with some regularity when I was riding the bus and listening to music when in school. Apart from the vocals sounding "tinny" and "distant", what stood out to me was that the bass was absolutely non-existant, which is entirely what you'd expect when taking the phase difference between the two channels. One other thing, though, is that it wasn't a mono signal. The two ears were still different, and if I had to try and describe it I'd say that the right ear was precisely the same as the left ear but with the phase inverted and slightly quieter. Flipping over the left part of the headphones "corrected" that part, and you got a more uniform sound with everything located in the "middle" again. Thing is, I'm not sure if this then became a monaural sound, still a mixture of the difference in phase between the two original channels, or if it totally corrected for the original problem. Inserting the plug in all the way, and (sometimes) holding it in just the right spot, of course, always solved the problem. While it seems impossible that this effect could be caused by the action of inserting the plug, might I suggest that it may be due to the bridging of contacts as you insert the plug interacting with the electronics of the amplifier in a certain way? For example, feeding back some of the current from one channel's output into the output of the amplifier for the other channel and travel backwards through that amplifier, setting up a small loop of the same as in the first channel but out of phase? i've done this too. its usually crappy o3.5mm sockets that cause it by having a small ground ring/pin. What happens is the ground connection is lost when the cable is pulled out slightly. and the audio signal loops through the cable using the ground connection to series the phones. its also a cheap and nasty way of adding surround sound to a 2 channel sound system by connecting a speaker (or 2 in series) to both + terminals on your amplifier. this speaker will now only play the phase different signals as these create a difference voltage wise. psudo pro logic. Would anyone mind speculating what other sorts of random weirdness can happen upon connecting a TRS regular headphone connector into a TRRS socket in a modern cellphone, which is supposed to handle both? My HTC Phone can barely stand it if i just _touch_ the connector. Sometimes I get the out of phase stereo thing, sometimes I get the double mono thing, sometimes the phone gets annoyed and decides I disconnected the headphones. All this with not even a minimal tug on the thing, just a bump. Wireless headphones are headphones that connect to a device, such as a smartphone, stereo speaker, television, gaming console, computer, or other electronic devices without using a wire or cable. Wireless headphones work by transmitting audio signals through either radio or IR (infrared) signals, depending on the device.